Every brand, company, product, person, team, etc has a conversation happening around it. That conversation might be happening by a handful of people, or a few billion people, but for everything and everyone, it’s happening. Notice all the lines around your brand? It suggests that the brand can’t clearly communicate with its customers, and that those customers can’t clearly communicate with your brand. And the key here is, as a customer I have to go THROUGH the conversation happening around your brand, before I can reach your brand. If that conversation is cluttered, or if I am getting inconsistent messages from your brand and its customers, it makes it more difficult for me to trust your brand, and less likely to want to do business with you. The above could be called an example of a ‘dirty’ conversation happening around this particular brand. Dirty conversations aren’t conducive to creating trust. So the question becomes how does your brand ‘clean’ that conversation. There’s two key ways. The first is by participating in that conversation. 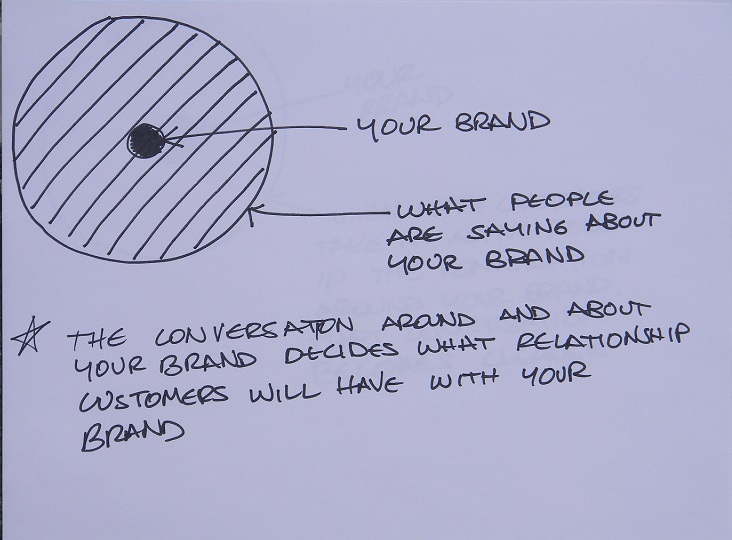 By participating in a conversation your brand changes that conversation. Part of participating in a conversation is listening to the other party. 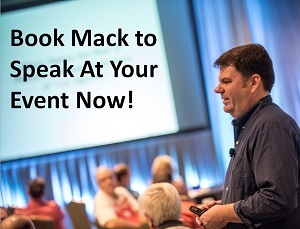 When you listen to your customers you have a better sense of your customers’ point of view. So you can apply that better understanding of your customers to your marketing messages. That alone will clear the conversation around your customers a bit, and make your brand’s messages more in line with what your customers are saying. The second way to clean a dirty conversation is to have your happy customers participating in that conversation. Your happy customers have a strong connection with your brand, and a greater level of understanding about your brand. So you want these happy customers to be interacting with other potential customers, and changing the conversation about and around your brand. Here’s a hypothetical for how this could work: In a few weeks I will be keynoting the Gulf Shores and Orange Beach Tourism’s Annual Tourism Summit in beautiful Gulf Shores, Alabama. I am going to ask the attendees to raise their hand if they consider the Gulf Shores and Orange Beach area to be one of the best places in the South to visit. I am betting every hand will go up because like me, I am betting all of the attendees will be big fans of the Gulf Shores and Orange Beach area. So the conversation about Gulf Shores and Orange Beach with that group would be very ‘clean’. But let’s say that next month I spoke at the Utah Governor’s Conference on Tourism in Salt Lake City. And let’s say I asked those attendees to tell me how many of them felt that Gulf Shores was one of the best places in the South to visit. My guess is that few, if any, hands would go up. And that’s likely not because the tourism professionals in Utah dislike the Gulf Shores area, it’s probably because they have never been there. So the conversation around Gulf Shores in that room in Utah would be a bit ‘dirty’. However, if I could take the tourism professionals I’ll speak to next week in Gulf Shores to Utah and have them, as a group, talk to the tourism professionals in Utah about the Gulf Shores area, the conversation in that room in Utah about the Gulf Shores area would change. The tourism professionals in Utah would get a better understanding of the Gulf Shores area, and they would likely be more willing to consider visiting Gulf Shores. In fact, science has proven this. Scientists at Rensselaer Polytechnic Institute concluded that it only takes 10 percent of a population holding an unshakable belief in order to convince the majority to adopt that same belief. In fact, the scientists found that this will always be the case. What that means is that if 10 tourism professionals from Gulf Shores that knew that Gulf Shores was an amazing place to visit interacted with 90 tourism professionals from Utah that weren’t familiar with Gulf Shores, that eventually the tourism professionals from Gulf Shores could convince over 40 of the tourism professionals from Utah to also believe as they do. That Gulf Shores is a great place to visit. Think about that, for a second. Take 90 people that have no strong opinion for or against your brand, and have them interact with 10 happy customers that LOVE your brand, and eventually those 10 fans will convince at least 41 of those 90 people to also LOVE your brand. 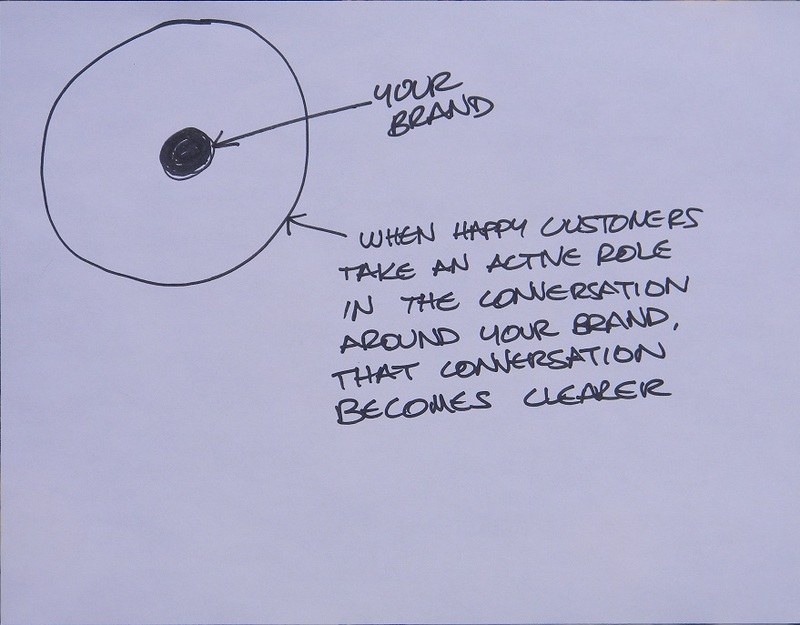 So while a brand has limited ability in most cases to affect and change a conversation about and around its brand, that brand’s happy customers can much more easily change the conversation about and around a brand. Notice here that it’s much easier for the brand to send out marketing messages, and its much easier for the brand to connect with its customers. There’s far less ‘clutter’ and the conversation around this brand isn’t ‘dirty’. That’s because the conversation around this brand has been ‘cleaned’ by having happy customers take an active role in that conversation. It’s also because the brand’s marketing messages have been changed and shaped by input and interactions with its happy customers. So the brand is sending out messages that are more in line with what those happy customers want and need to hear. How clean is the conversation around your brand?